New York Governor Nelson Rockefeller turns a prison-wide protest into a wholesale slaughter. CSU Archives/Everett Collection Police officers identify dead bodies at Attica prison, 1971. Editor’s note: This article first appeared in the September 27, 1971, issue of The Nation. One of the convicts in the maximum security "correctional facility" at Attica, NY, ad-dressed the ad hoc committee of observers assembled within the prison walls: "We do not want to rule; we only want to live…but if any of you gentlemen own dogs, you’re treating them better than we’re treated here." On that basic fact there is general agree-ment. Only twelve days before the uprising, State Correction Commissioner Russell G. Oswald sent a taped message to the 2,000 inmates outlining the steps he was working on to make conditions more nearly bearable. "What I’m asking for is time," he told the prisoners, but time ran out on him. About half the prisoners rose in what amounted to an insurrection which, prudent foresight suggests, is a harbinger of worse to come. They had no firearms. The assault force, also numbering about 1,000, was heavily armed. When they had done their. work, thirty-nine men were dead–nine hostages out of the thirty-eight that the convicts had seized, and thirty convicts. Could this bloody outcome have been avoided? One can only conjecture, but the consensus among enlightened observers is that it could. Mayor Kenneth A. Gibson of New-ark termed the suppression "one of the most callous and blatantly repressive acts ever carried out by a supposedly civilized society on its own people." Now Governor Rockefeller is calling for the formation of a five-member panel to investigate what happened. It is to consist of "some top people in the correctional field." In Commissioner Oswald he had a top man, who negotiated with the inmates and seems to have made a good impression on the committee of observers. But the Governor refused to come to Attica, although his mere presence in the town — no one expected him to go inside the prison walls — might have cooled things off sufficiently to enable an agreement to be reached. And, knowing nothing of the circumstances, President Nixon expressed his support of the Rockefeller hard line. There was undoubtedly a lunatic fringe among the inmates–those who demanded their release to a "non-imperialist power"–but the great majority of those who took part in the insurrection were rational men. Some were rational in the sense that all they wanted was better living conditions and the respect due them as human beings. Others were rational in a revolutionary sense: they were ready to die rather than continue to submit to society’s treatment of them. They died, and they won. America’s image is further tarnished before the world and, as Senator Muskie said, "the Attica tragedy is more stark proof that something is terribly wrong in America." That view contrasts with Rockefeller’s statement that the uprising was brought on by "the revolutionary tactics of militants," and that the investigation would include the role that "outside forces would appear to have played." Whatever outside forces were involved could not have moved a thousand men to such desperation. 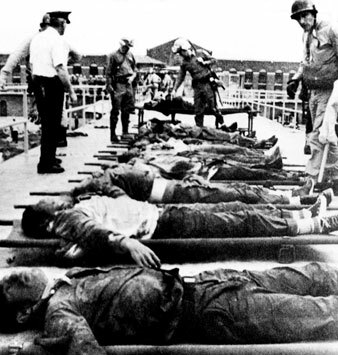 The Attica massacre, in one aspect, was a victory of the "tough" school of penologists and the reactionary elements in American society over the modernists. Oswald never had the support of the Attica staff, nor of the townspeople, most of who make their living from the prison. They favored the former commissioner, who had come up through the ranks and was noted for his toughness. It was the reactionary elements that circulated a report that the nine hostages had had their throats cut by the convicts, and that one had been castrated. This lie was nailed by Dr. John F. Edland, the county medical examiner, who made an impressive appearance on TV. He examined eight of the bodies and found that all had died from gunshot wounds. Another medical examiner came to the same conclusion with regard to the ninth victim. The insurrectionists appear to have been responsible for only one death–that of a guard who–was thrown out of a win-dow and who died before the battle in the prison began. Canards of this virulent type usually mark unjustified action by the guardians of law and order. At Kent State sniper fire was alleged to have impelled the Guardsmen to fire on the students. The commanding general fell back on this excuse and clung to it long after it had been disproved. Several hundred thousand Americans are inmates of American prisons. At Attica, 85 per cent were Negroes or Puerto Ricans, in the custody of guards who, as one shouted on TV, hated "niggers." Society locks them up to get rid of them–the "correctional" label is a farce. Even separated as they are by incarceration in numerous state and federal penitentiaries, they constitute, morally and even physically, a formidable force. To return to Senator Muskie’s evaluation: the rebellion shows that "we have reached the point where men would rather die than live another day in America." The only solution, he said, was "a genuine commitment of our vast resources to the human needs of all the people." Failure to heed such words would be not only inhumane but stupid. The observers invited into the prison by the insurrectionary inmates (see Tom Wicker’s superbly evocative dispatches to The New York Times of September 14 and 15) were impressed by the tactical skill, the poise and the single-mindedness of the defiant men. These prisoners were politicalized, using the term here not primarily with respect to whatever ideological convictions they may have held, but in the sense that they were aware of themselves as a considerable group sharing common experiences and goals. The uprising at Attica very little resembles prison riots of the past, when goaded men suddenly began beating on their cell bars, hurling their food to the mess hall floor and screaming obscenities at their jailers. This was group action, not mass hysteria. It is the latest, but not in all prob-ability the last, manifestation within a penitentiary of, what for lack of a better term is called today black nationalism. But Attica was not a racist movement; blacks and Puerto Ricans were predominant in the resistance, as they predominate in the prison, but many whites stood with them. It was a class action–the class of the disinherited. When men who have nothing discover that they have one another, they combine into units that are incalculably formidable. That is why the words of sane and compassionate men must be heeded. American prisons have never been institutions; they have always been receptacles. But prisoners are not garbage. It is bad enough–indeed, it is probably wicked–that we deprive them of their freedom, but from now on if we also take from them all hope of a future, we may expect Attica to become the name for a new kind of war. Commissioner Oswald knew that before the first hostage was seized; Rockefeller and Nixon will no doubt fade into the recesses of history with their eyes unopened.